Bucking the Trend | Spaceship! Spaceship! Spaceship! Buck Rogers in the 25th Century has not aged well. Made in the late 70s / early 80s when the entire world was trying to emulate the success of STAR WARS, it perhaps best serves now as an example of how difficult it is to reproduce that film’s magic formula. If one element stands out it’s the Thunderfighter craft flown by Buck and Colonel Wilma Deering. Tellingly, it’s designed by legendary concept artist Ralph McQuarrie, who stepped onto the show fresh from working with George Lucas. 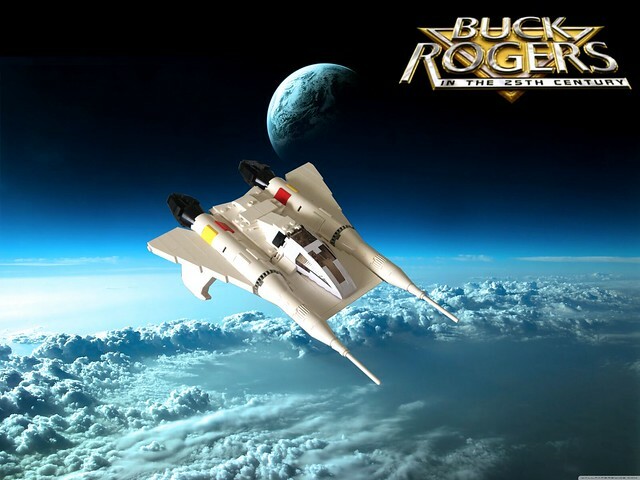 (In fact the Thunderfighter was originally designed for sister show Battlestar Galactica, but lost out to the Colonial Viper) It’s such a good design however it could easily have stood in the Star Wars world also; and now Lego Admiral has built it out of LEGO and placed it on the internet for our viewing pleasure. This entry was tagged MOC, swooshable. Bookmark the permalink.